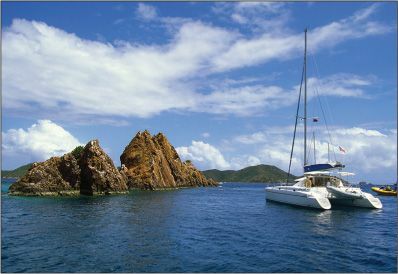 “The British Virgin Islands are everything you hope for when fantasizing about an escape to a tropical paradise,” said Gina Verseci in The Boston Globe. My husband and I once chartered a crewed catamaran with another couple for a weeklong tour of the Caribbean archipelago, and the journey turned out to be “the most sublime vacation we’ve taken to date.” We sailed from island to island, stopping to swim in crystalline waters, lounge on white-sand beaches, and refresh ourselves at countless beach bars. Since that trip we’ve longed to return, so we recently took our three girls on a mini version of our previous expedition, zipping between islands on a chartered power catamaran. This time, we weren’t hauling as much booze as we once had, but we did enjoy more than one Painkiller—the nutmegdusted rum punch that’s the official cocktail of the BVIs.